The purpose of the TMS BIM-M Committee will be to provide a structure for implementing and maintaining BIM for the masonry industry. This project is at the core of masonry BIM. Because masonry BIM is a computational model of masonry construction, and masonry walls are the fundamental assembly in masonry construction, it is critical that the data representation of the masonry wall support all of the functionality that is envisioned for BIM-M. Currently, it is simply not computationally practical for BIM software to track individual masonry units in an entire building. Therefore the masonry BIM data structure must include the definition of wall types, and must provide the means to map these wall types onto regular and irregular regions on wall surfaces. This project will develop requirements for the digital representation of masonry walls in BIM systems. This will lead to the development of masonry families, through which a set of masonry units (extracted from the data structure defined in the masonry unit project) are arrayed according to established rules to take a generic wall in BIM and represent it as a fully-described masonry wall. It is anticipated that these walls will be represented in different levels of detail depending on the needs of the BIM user. For example, in early stages of design and on large-scale buildings, walls will be represented as regions without populated masonry units (wireframe mode). As more detail is required, these regions will be populated as masonry units represented as 2-D polygons, and finally as full 3-D photorealistic rending with masonry units modeled as solids. In addition, the wall definition must include the propagation of masonry units in various bonding pattern with modular coordination of masonry veneer and backup systems. The Initiative will be retaining the services of the Digital Building Laboratory of Georgia Institute of Technology (Georgia Tech) to complete this project. However, it requires masonry industry input. Specifically, the TMS BIM-M Committee will perform the initial development of 10 typical masonry wall type definitions, which will be used by Georgia Tech to further develop the digital representation of masonry walls in BIM systems and to develop masonry libraries for BIM. The initiative created five workgroups during Phase I: architecture, structural engineering, general contracting, masonry contracting, and material supply. The chairs of the architectural and structural workgroups will continue to work on the TMS BIM-M Committee, and working group members will be asked to participate as subcommittee members. The expectation is that the initial organization of the TMS BIM-M committee and the development of the 10 wall systems would be completed by December 31, 2013. Their work product would form the basis for Georgia Tech’s work starting in January 2014. Develop user guidelines once software is available. Develop educational programs, seminars, and webinars for architects and engineers. The initiative has a separate program for education of masons, contractors, construction contractors, and construction managers. This committee will provide input into those programs as well. 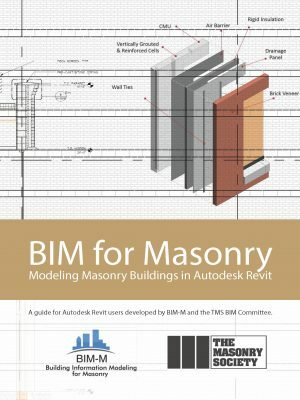 Prepare masonry standards related to BIM-M. The Initiative is becoming a member of the National BIM Standards committee for the building Smart Alliance, a council of the National Institute of Building Sciences. As the committee matures, TMS BIM-M could become the representative of the masonry industry. Be the leader in maintaining BIM-M within the masonry industry after the national initiative is completed. TMS’s BIM-M Committee is assisting in the implementation and maintenance of the Roadmap of the National Building Information Modeling for Masonry Initiative. The Masonry Society (TMS), International Masonry Institute (IMI), International Union of Bricklayers and Allied Craftworkers (IUBAC), National Concrete Masonry Association (NCMA), Mason Contractors Association of America (MCAA), and Western States Clay Products Association (WSCPA). TMS Members, Darrell McMillian and Daniel Zechmeister, were on the Executive Committee for Phase I of this Initiative, and TMS Member David Biggs is the Masonry Industry Coordinator for the Initiative. During Phase I of this Initiative, the document “A Roadmap for Developing and Deploying Building Information Modeling (BIM) for the Masonry Industry” was developed. This roadmap notes a series of phased projects that the masonry industry must undertake in order to prepare the technical foundation (software) for masonry BIM (BIM-M) and to prepare the industry to implement masonry BIM (education).